Package contains 1 Olympic Queen Flat Sheet, 1 Olympic Queen Fitted Sheet and 2 Pillow Case in a beautiful zippered package. Wrap yourself in these 100% Egyptian Cotton Superior bed sheets that are truly worthy of a classy elegant suite, and are found in world class hotels. Woven to a luxurious 1000 threads per square inch,these fine Luxury Bed Linens are crafted from Long Staple Giza Cotton grown in the lush Nile River Valley since the time of the Pharaohs. Comfort, quality and opulence set our Luxury Bedding in a class above the rest. Elegant yet durable, their softness is enhanced with each washing. You will relax and enjoy the rich, soft and luxurious feeling of cotton sheets. Package contains 1 Flat Sheet, 1 Fitted Sheet and 2 Pillow Case in a beautiful zippered package. Wrap yourself in these 100% Egyptian Cotton Superior bed sheets that are truly worthy of a classy elegant suite, and are found in world class hotels. These fine Luxury Bed Linens are crafted from Long Staple Giza Cotton grown in the lush Nile River Valley since the time of the Pharaohs. Comfort, quality and opulence set our Luxury Bedding in a class above the rest. Elegant yet durable, their softness is enhanced with each washing. You will relax and enjoy the rich, soft and luxurious feeling of cotton sheets. We also carry matching Duvet Set, Pillow Case sets, Bed Skirts and Shams to complement your order. We offer a wide selection of OVER 3,000 elegant Egyptian Cotton bedding products: Sheet Sets, Duvet Cover Sets, Pillow Case Sets, Shams, Down Comforters, Down Pillows, Down Alternatives, Bed in a Bag Sets, Jacquard Towel Sets, Bath Robes, and so much more! 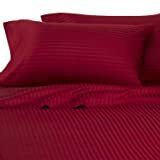 The Grand is a luxury 100% cotton sheet set manufactured with durable 2 ply yarns. The sateen finish adds a soft subtle sheen. The fitted sheet is elastisized all the way around to hold the sheet nicely into place and had deep 15" pocket that fit up to an 18" extra deep mattress. 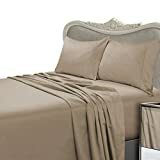 The flat sheet and pillow cases are finished with a 4" hem and filled piping for that exclusive, elegant, luxury finishing. 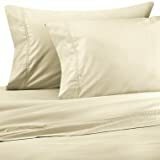 Perthshire Platinum Collection 1,000 Thread Count 100% Egyptian Cotton Sheet Set. Bring home the feeling of the most luxurious resort hotel without leaving your bedroom with this affordable set of 1000 thread count sheets. The most luxurious comfort available, our Egyptian cotton sateen sheets have 1,000 threads per square inch for a noticeably smooth hand, an elegant drape, and a lustrous finish. Woven of the finest quality two-ply cotton yarn. Feel this incredible quality and you will be satisfied. Extra deep pockets are guaranteed to fit up to an 18" deep mattress and fully elasticized all around. 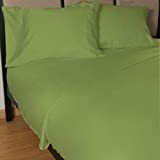 King size set includes one flat sheet 108" x 102", one fitted sheet 80" x 80", and two king pillowcases 20" x 40". Enjoy a cool and comfortable night's sleep with exceptionally thin breathable sheets that have a silky soft feel and a lustrous finish. 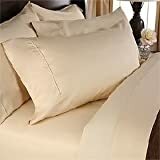 These sheets provide a lasting vibrancy of color no matter how often they are washed and are made of high strength micro fiber yarns that will stay soft and wrinkle free for years to come with the soft touch of 1000 thread count Egyptian Cotton sheet set. Soft to the touch, easy care No ironing necessary.Deep Pocket Sheets for oversized Mattresses.